JBailey,The Tiles I want to add for my maps. Hi. This is a thread I've said I would post, to get the help I need to include this stuff for my maps. It was mainly for JBailey, as I told him time before opening this post, but everyone of you who know how to help me is, of course, welcome . If you need a bigger pic for the Wall Tiles, I've got all of them in bigger size. Remember to explain it well, so I can understand it, I haven't got a single idea of programming, as I've said a thousand times. Thanks, before all, and feel free to answer. Last edited by MagusElOscuro; 01-27-2013 at 03:02 PM. 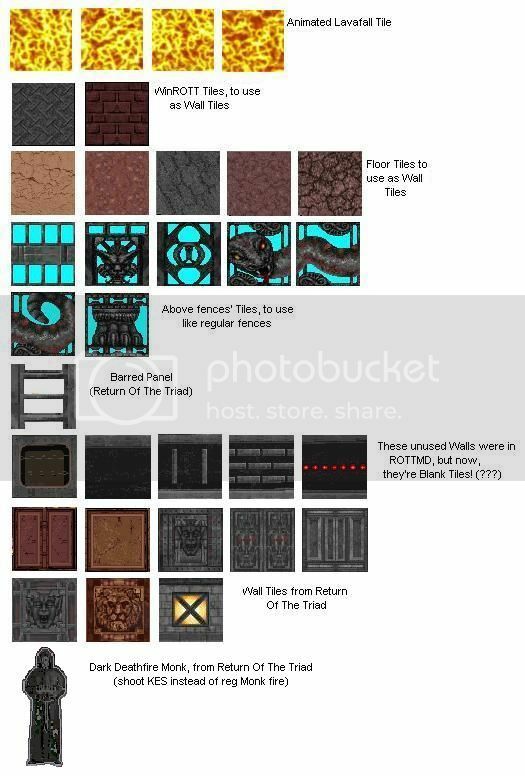 Re: JBailey,The Tiles I want to add for my maps. to a rott editor, so your stuff could be included properly. to the original sizes/resolutions of the original artwork that your replacing. Eeer...where to begin? First of all, the XWE is not an aid for me, totally the opposite, as I only can use it to view the items, textures, etc. I've not a single idea of how it works, and I can't understand a single piece of it. I tried to copy and paste a Sprite (you see how "difficult" the operation was), and it got blurry and with a freaking appearance in orange-ish hue. So I think this is the last time I use that tool. And its help menu does not "help" at all, unless you're a programmer. For me it's like if it was talking to me in chinese. I'm gonna give a try to that R3Dedit. (is this one the Doom editor you were talking? because that DeePsea is not freeware...). I'll let you know if it helped me...but I'm not too optimist about....But hey, even if I get the DDFire Monks' Sprites created...how do I manage to make them shoot KES instead of reg fireballs? Oh, and talking about Source Code. Where is supposed to be the Source Code of the editors? I haven't found any file about that. I've got the ROTT's Source Code and it's like an idle in the file. In other words, I haven't used it for absolutely nothing. And more important. What should I do with that Editors' Codes? Is that also a difficult uncomprehensible task such as all the work I've tried before? I've "tried" it....a joke. It doesn't open. Gives an error. So I deleted it. Thanks for the help, anyway. Last edited by MagusElOscuro; 01-29-2013 at 06:06 AM. And the source code, I repeat, or it's not included, or I can't find it...in any of the Editors I've got (ROTTMD...until it need a PIN, ROTTed and ROTT3Deditor 1.24). Is Doombuilder (or Doombuilder2) valid for importing that artwork as WAD? Last edited by MagusElOscuro; 01-30-2013 at 05:59 AM. the source code to his current editor, but so far, he has said no. But if I import the Tiles to ROTT3Deditor as saved Doom WADs, they should then work, right? Or at least this option is for this, no? If not, why is it included? Well, I will try to get Doombuilder and tell you if it helps. I hope yes. I've seen maps in ROTTpository that include things which are NOT in Darkwar/Extreme. And there has got to be a way to do that, considering they used the ROTT Editors.